Important parameters for the differentiation of obstructive ventilation disturbances are FEV1, FEV1/VC (spirometry | quantitative assessment), residual volume and airway resistance. Residual volume and airway resistance can only be measured by means of body plethysmography. 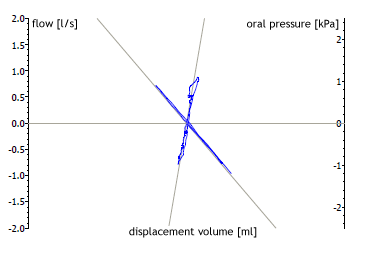 In order to determine resistance, oral pressure is measured. 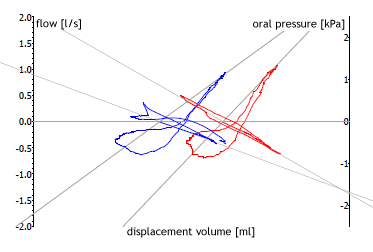 This value can then be illustrated graphically in a flow-pressure curve ( = “respiratory loop”). 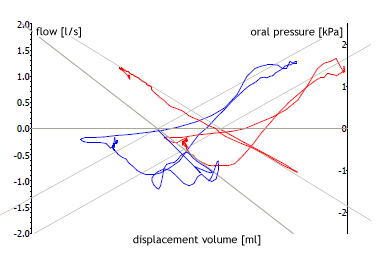 Flow and oral pressure are plotted against displacement volume, creating two loops. In the case of obstruction, both loops intersect at an angle of > 90°. In the absence of obstruction (healthy individuals or those with restriction), the angle is < 90°. If emphysema is present, the respiratory loop takes on a typical club shape. In contrast to the flow-volume-curve, inspiration runs from the zero line upward and expiration downward. The slope of the line thru the loops is steep in pulmonary healthy persons resulting in a small cutting angle. In obstructive ventilation disorders a large cutting angle is observed. This is due to a higher resistance in obstruction requiring a higher pressure to create the same flow rate. In physical terms this corresponds to: resistance = pressure / flow (Ohm’s law in electricity R = V / I). In emphysema and air trapping there is an end-expiratory bronchiolar collapse resulting in an increase in both pressure and residual volume at the end of the expiration as compared to its beginning. 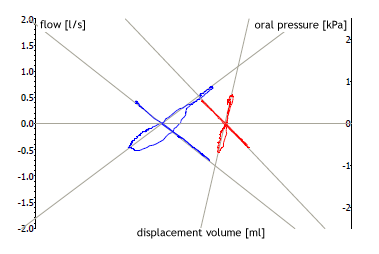 Graphically, this corresponds to a club-shaped form of the respiratory loop being widened in the downward part and not intersecting the x-axis in the same point. Findings: the intersection angle of the loops > 90° as a sign of obstruction. Marked club form as an indication of emphysema. Virtually no difference between before (blue) and after (red) bronchodilation. Findings: intersection angle of the loops > 90 as a sign of obstruction. Club form as an indication of emphysema. Under bronchodilation, minimal lessening of the angle, with slight narrowing of the club shape as an indication of minor air trapping. Findings: intersection angle of the loops > 90° as a sign of obstruction. Club form recognizable as an indication of increased residual volume. Under bronchodilation (red) normal respiratory loop as an indication of reversible obstruction and air trapping.